When your company is facing a challenge that only software can solve, you have two options. The first is commercial off the shelf software (COTS, in shorthand), and the second is custom designed software, and choosing between the two can be tricky. There are obvious advantages of custom software, but you may be leaning toward COTS because it’s cheaper. And investing in any software solution can be an overwhelming experience. Pick the wrong package, and your business pays the price in lost productivity and lost profits. The good news is that it’s actually easier to make a well-informed decision about software development than most people realize. There are plenty of reviews out there of off the shelf software for every industry need, so if you’re dead set on choosing COTS, you can make an informed choice. Meanwhile, the advantages of custom software are easy to understand, which means you can feel good about investing in custom software development if that’s your final decision. Of course, maybe you’re not quite ready to make that leap. That’s why today, we’re going to outline the advantages of custom software and show you some custom software examples that illustrate why custom development is absolutely worth the investment. Simply put, custom software is a solution that is specifically developed to overcome a particular challenge in your organization. Of all the advantages of custom software, the fact that it does exactly what you need it to do is probably the most important one. When you look at examples of tailor-made software, what you’ll see are programs designed to do exactly what was outlined in the pre-development requirements. 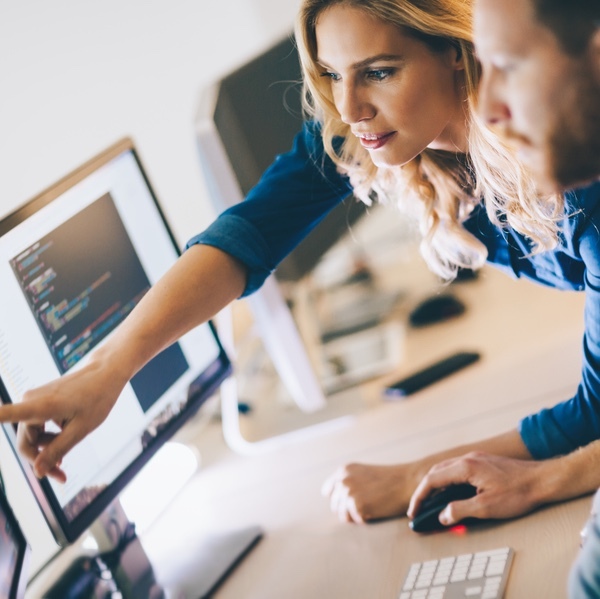 When you opt for custom software development, you can design a product that makes your internal processes more efficient, merges several systems into one easier to use platform, and makes life easier for both your employees and your customers. Custom software can be whatever you want it to be, even if your needs are complex or your user base is huge. Ready-made mass-market software, on the other hand, is often designed to meet many challenges, but typically either won’t meet all the challenges a company is facing or will be overly complicated because it’s trying to meet too many challenges at once. In both cases, you’ll likely discover you need a team of IT specialists to get it to adapt to your organization’s actual needs — or that you need to ask everyone at your company to adapt to the software. That said, most companies do use some packaged software. Microsoft Office is a good example of a common COTS product used by many organizations because it’s easy, familiar, and doesn’t require customization to be useful. When your needs are simple — e.g., word processing — off the shelf software gets the job done. But when you need software for tens of thousands of users, your company has to adhere to special security compliance regulations, you have business processes in place that cannot be changed, or your needs are otherwise complicated, custom is the way to go. Custom software won’t include functionality you neither want nor need, so you’re never paying for features that are essentially useless or upgrades that don’t add anything you can actually use to the platform. There’s no need to change your business processes and systems or to retrain staff to use your new software when it has been designed to suit the way your organization operates. The sky is the limit when it comes to custom software development. As long as you can explain your requirements to your developer, you can build a software solution that will address just about any business challenge. Custom software is scalable and can evolve as your company evolves, but is also useful as-is over the long term because it does not usually require the frequent updates/upgrades required by off the shelf software. Software that has been developed specifically for your company can integrate with existing software infrastructure. There’s no need to replace the systems different departments are currently using because custom software can become a bridge between those systems if it needs to. Custom software may even give you a competitive advantage by making your organization more productive, more efficient, and more profitable than its competitors. Let’s look at some real custom software examples and how these platforms are meeting the needs of businesses better than COTS ever could. A large real estate mortgage broker came to us looking to develop a web-based platform and a mobile app from scratch in order to manage all aspects of their business. They needed a CRM, CMS, deal flow management, and thorough reporting, among other things, and from the start we worked closely with the client to not only understand what functionalities they needed, but also what they wanted the software to accomplish in the short and long terms. Ultimately, we discovered that what they needed most was the ability to run reports from all possible angles and to track different data from different perspectives. Today, their whole enterprise runs on the custom software system we built. There is no way one single COTS solution would have been able to meet the client’s diverse needs. This client came to us because they needed a simpler way to manage the thousands of payments, deposits, and fees they were dealing with each week. Off the shelf accounting software was not up to the task of handling the sheer volume of transactions happening on any given day, and in any case, they needed a simpler way to manage the money going in and out. The custom portal we designed with the client is able to manage all of it, condensing several hours of work into a few minutes by automating many processes. It can even send alerts when something doesn’t add up. The main advantage of custom software in this project was user-friendliness. The portal we built was specifically streamlined for users — including those users who were less tech savvy. A catering company in the private aviation industry came to use looking for a state-of-the-art solution to automate and increase efficiency and transparency in its multi-step ordering and fulfillment processes. The firm deals with vendors all over the world, any time day or night, and there are a lot of little details that need to be handled with perfect accuracy. The custom software system we designed and built for the client helps them efficiently process hundreds of orders each day across 10,000 airports worldwide, but it also does a lot more — and that has helped the company become a leader in its field. Now that we’ve shown you the major advantages of custom software, let’s take a look at the biggest downsides of some COTS software examples. The first is that off the shelf software really isn’t plug and play. Sure, you can fire up Microsoft Office in a couple of minutes, but if you’re looking for anything more complicated than a word processor, some degree of customization will be involved in the implementation and you’re going to be paying for a lot more than just the software itself. Think of applications like SAP ERP or Seibel CRM — neither is an application you can simply install and launch. There is scripting that needs to happen to make each application do what you want. Some companies employ whole teams of programmers whose only job is to work with these programs. Depending on your in-house resources, you might need to bring in consultants to help you adapt your business’ processes to the limitations of the software. And of course, training is a big business, because deploying and using these monolithic systems is harder than most people realize. The second major downside of COTS is that it isn’t the money-saver people often think it is. As noted above, it’s easy to end up paying for features you’ll never use because they’re not relevant to your business. Then there’s the cost of annual licenses, configuration, training for your staff if they have to adapt to new processes, upgrade charges, outsourcing support, and new IT personnel. The fact is that off the shelf software is also almost never as inexpensive, simple to launch, or easy to use as salespeople claim it will be. Rolling out new “out of the box” software can actually take longer than having easier to use custom software that fits your existing processes developed from scratch. We do realize that all businesses have common needs, and sometimes COTS can help them meet those needs. But we also believe that there comes a point at which growing companies need to look beyond simple, one size fits all software solutions so they can differentiate themselves from the competition. Our Shifting Perspectives® method looks at an organization’s current systems, processes, objectives, and goals at all angles to reveal the unique software solutions that will rocket them forward. Are you ready to invest in custom software? Contact Bitbean for a free consultation. We are always totally transparent about what the road from idea to implementation will look like, so you can plan for the future.